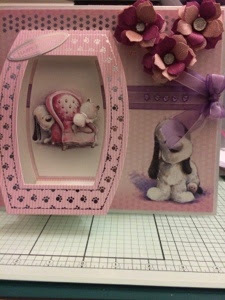 Well I decided to enter into the Crafter's companion monthly challenge blog which this month's theme was flowers. I raided my Barkley paper pack and came out with this card. The base card is centura pearl. This is gorgeous Sam, love the beautiful design. Lovely card - sweet image, lovely design. swet and very beautiful Sam.